A Fullington bus circa 1929. In 1908, the Fullington Auto Bus Company was born from humble beginnings, as the purchase of a horse-drawn carriage to transport residents to the local train station evolved into a thriving family business, building a legacy of service passed down through four generations. Now in 2018, after 110 years of service, the Fullington Auto Bus Company in State College is proud to say it is again 100 percent family-owned and operated, offering public and private transportation aboard deluxe motor coaches, transit buses, limousines, vans, and school buses. For the Fullington family, acquiring full ownership of the company has been a long journey. According to the Fullington company, in 2009 Paris-based RATP Dev, the fourth-largest ground transportation company in the world, approached Aerial Fullington Weisman, then Fullington’s CEO, about partnering to enter the U.S. market. Fullington decided to sell majority ownership of the company to RATP Dev. Although the company described it as a productive and positive experience, Fullington’s management team eventually decided that Fullington was meant to be a family operation. Negotiations to re-purchase the company began in early 2017 and concluded in December, when the transportation service provider announced that owners Michael and Lory Fullington had purchased all outstanding company stock shares from RATP Dev. “When I bought the company back on December 27, that was the first time that one Fullington owned 100 percent of the stock since 1918,” Mike Fullington says. In 1908, Emerson M. Fullington and his three sons, Ai, Roy, and Richard, were running a successful lumber supply company in Clearfield. But Fullington was ready to grow his business into something more, so he began a livery and surrey company, according to the company. Fullington purchased a nine-passenger horse-drawn surrey to transport residents from Curwensville to the nearest railroad station, in Clearfield seven miles away. 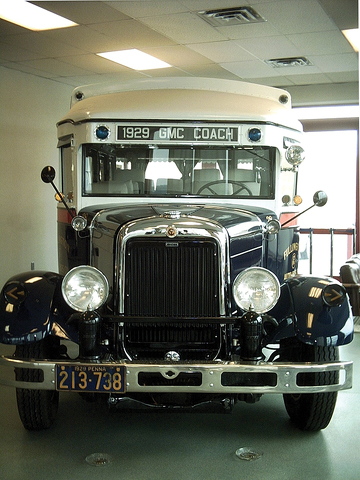 The Fullington Auto Bus Company was born, and has now been passed down through four generations. Within seven years, two Model 15 White buses replaced the surrey. The horse barn was then transformed into a bus garage, on the site of the present-day garage on Cherry Street in Clearfield. Growth continued – both in fleet size and territory – over the following decades. Fullington continued to expand its scheduled service during World War II, as the bus between Clearfield and Tyrone was loaded several times a day carrying troops headed to war and home again. In 1981, the company became part of the Trailways system. Mike Fullington got started in the business around age 12, when his father would have him wash school buses and paint the seat railings during the summers. In 1975 at age 21, Mike started driving motor coaches, then returned to State College in 1976 where he has remained ever since. Lory came into the business in 1978. Over the years, Fullington’s buses have evolved in terms of size, comfort, luxuries, and safety. During that period, the cost of the buses has risen dramatically as well. In 1981, the average bus cost $95,000. Today, they are up to around $550,000. Fullington President and CEO Jonathan Berzas joined the company in 2011 after a career in transportation that included years with American Airlines, Greyhound, and his own charter-tour company. When he first came to interview with Fullington, he was impressed with how focused they were in the process of hiring their first potential non-family president. Berzas encouraged the Fullingtons to buy the company back, after RATP had announced that it was going to sell its shares of the company. Not counting service vehicles, Fullington owns about 320 vehicles, consisting primarily of school buses and motor coaches, and also a small limousine division. Headquartered in Clearfield, the company has 11 terminals in Pennsylvania. However, destinations can go far beyond the Commonwealth. In 2016, Fullington traveled to the Republican National Convention in Cleveland and the Democratic National Convention in Philadelphia. Fullington also travels to major sporting events, including two upcoming over the next year. For the Fullingtons, the business is about the people in the local community. With the hard work and tireless efforts of so many dedicated people, the company hopes to continue to be a leading transportation provider for many years to come.